What Else Can I Expect From an Online Bachelor's in Cybercrime Program? The best online degree in cybercrime programs allow you to elegantly merge your interests in criminal justice and cutting-edge information technology into a single degree program. As evidenced by more recent issues relating to the hacking of medical and financial databases and the use of internet to infiltrate and steal information from government bodies across the globe, cyber security is an increasingly relevant and rapidly growing sector. As computer networks become more and more complex, breaches in security require more specialized knowledge of information systems in order to apply legal principles towards the resolution of criminal cases. According to the Bureau of Labor Statistics, positions in the cybercrime field, such as information security analyst, are projected to grow up to 18% by 2024, an extremely high increase. 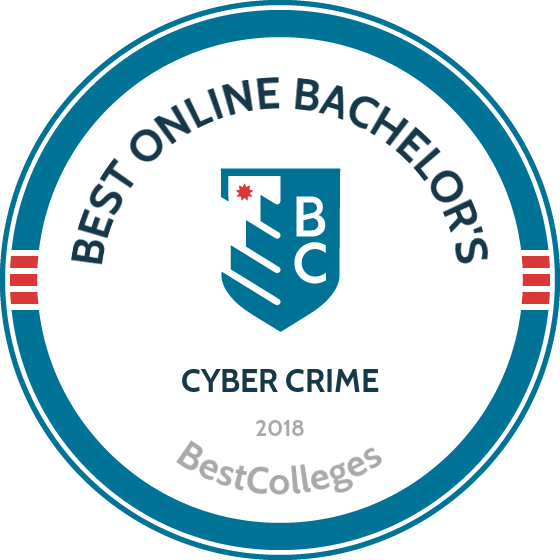 This article provides an overview of the field, including a listing of the best online degree in cybercrime programs in the United States today. Cybercriminology is an interdisciplinary, highly specialized subfield of the broader field of criminal justice. (Interdisciplinary means that the field draws from a variety of disciplines often treated separately by academic institutions.) Grounded in technology, the nature of the field demands constant change, alteration, and advancement. In turn, cybercriminology is unique in its focus on an actively evolving technological standard, and programs may vary in elements such as what programming languages they offer and in their ability to leverage relationships with governmental bodies. Most cybercriminology programs feature a programming and data architecture focus, and learners can assume that all accredited programs are fluent in current issues and hot topics within the field, such as computer fraud and financial crime, or firewall and intrusion-detection. Example concentrations include data security for global organizations, data-network administration, and security consultation for small business-owners. While most criminal justice programs that specialize in internet-based securities offer a comprehensive array of current standards within the field, some online degree in cybercrime programs may have additional ties to exciting internship programs that speak directly to your specific interests and goals. Keiser University's Fort Lauderdale campus delivers a bachelor of science program in cyber forensics and information security that is specifically designed to meet the needs of transfer students. The degree completion program welcomes students with existing associate-level degrees in computer science-related fields, guiding them toward advanced, employer-preferred credentials. Students must earn a total of 60 credit-hours, including 12 credit-hours in key supplemental study areas including statistics, critical thinking, written communications, and information systems. Students learn skills in three core areas of focus. First, the program emphasizes proficiency with current information security tools and technologies while building students' knowledge of digital forensics techniques. Second, students learn how to detect, respond to, and neutralize cyber security threats while protecting data and critical information. Finally, students in this cyber crime degree program learn the documentation and forensics processes that adhere to legal guidelines that help authorities prosecute the perpetrators of cyber crime. City University of Seattle offers a bachelor of science degree in criminal justice with an emphasis on cyber forensic information that provides students with the skills needed for careers in corporate or cyber investigation or data and information risk. Military personnel or individuals with prior experience and training in cyber information investigation are ideal for the program, which is applicable to both the private and the public sectors. In addition to the criminal justice core coursework, students earning the cybercrime degree online take courses on the investigation of cybercrime, cyber and surveillance law and governance, information security, and tools and techniques for cybersecurity professionals. Students complete a capstone course that involves case studies demonstrating how criminal justice and policies have failed in the past. Admission to the 180-credit program requires applicants to submit all prior transcripts. For the criminal justice degree with an emphasis on cyber forensic information, students with military or prior criminal justice training may be able to use that experience for up to 25 elective credit hours. Champlain College is a Burlington, Vermont-based institution founded in 1878. The school's online bachelor's degree in computer forensics program prioritizes hands-on learning, and students develop the advanced ability to spot network hacks, identify security breaches, and take effective action to secure digital assets. Students also learn how to trace the sources of cyber security breaches, recover compromised data, and analyze data for the possible presence of additional threats. Beyond computers and computer networks, coursework also covers mobile devices, giving graduates an edge in this rapidly growing area of cyber security. Champlain College is home to the Leahy Center for Digital Investigation, a world-renowned research facility and cyber crime lab. The school offers more digital forensics courses than any other college in the United States and produces graduates ready for careers with mid- to large-size corporations, law enforcement agencies, and crime labs. This cyber crimes degree program can be completed entirely online, with seven-week course schedules to accelerate students towards graduation. The online bachelor's degree in cybersecurity and forensics at Hodges University is certified through the Committee on National Security Systems and prepares students to work in the national security sector upon graduation. Based in Naples, Florida, the cybersecurity and forensics program at Hodges University is ideal for students who are skilled problem-solvers, have strong critical thinking skills, and who want to work with new technologies. Students earning the 120-credit cybercrime degree online take courses in web and program design, hardware support and operating systems, network defense, security penetration tracking, and ethical hacking. The capstone course embedded within the online cybersecurity and forensics degree focuses on systems analysis and solutions architecture. Graduates can work as specialists in security, intrusion, and vulnerability within private industries and public agencies alike. Applicants must submit transcripts, exam results, and a personal essay. An interview may also be part of the admission process. Based in Norfolk, Virginia, Old Dominion University offers a 120-credit cybercrime degree online through its interdisciplinary studies program. The online cybercrime degree incorporates aspects of criminal justice, information technology, computer science, and philosophy as part of its comprehensive approach to preparing exerts in the cybersecurity field. The online cybercrime degree provides students with a comprehensive understanding of cybersecurity, computer and data technology, cyber law, and digital forensics. Coursework includes introduction to criminology, cybercrime and cybersecurity, and a survey of the criminal justice system. The degree prepares students for legal or policy-based careers aimed at preventing cybercrime, which includes fraud prevention specialists, computer crime investigators, and vulnerability researchers. Virginia community college students who apply to ODU are guaranteed acceptance after submission of a letter of intent to continue coursework at ODU. First-time or transfer undergraduate students must supply appropriate transcript information and complete an online application. Located in Virginia Beach, Virginia, Regent University offers a bachelor of science in cyber and digital forensics degree through the lens of Christianity. The cyber and digital forensic program provides students with the skills needed to assess theories of cyber and digital security, examine digital footprints, detect and track information technology security breaks, and troubleshoot problems related to digital forensic applications. Students must complete a 120-credit degree that blends biblical and Christian learning with courses on networking and telecommuting concepts, network defense and security, cyber crime and digital investigation, and mobile and malware forensics. Courses provide students with the skills needed to work as cyber risk managers, intelligence investigators, and digital forensics specialists in private and public cyber defense sectors. Online and transfer students must submit transcript information along with SAT, ACT, or CLT scores for admission. A personal statement is also required. Students begin RMU's online bachelor of science in cyber forensics and information security by completing a required set of communications courses before proceeding into the core component courses that make up the degree concentration. The program's core courses combine technology education with important aspects of business, organizational behavior, and topics in law and cyber crime. Though the coursework in this cyber crime degree program can be completed entirely online, students are invited to Washington, D.C., for two weeks each year, where they attend an intensive national security seminar. The seminar component is designed to help students build a solid understanding of government policy and public-private sector interaction. Graduates emerge ready for dynamic careers in information security, an in-demand field with excellent future growth prospects. Students can also apply online free of charge. Utica College offers one of the most comprehensive cyber crime degree programs in the United States through its bachelor of science in cybersecurity. Students enjoy the flexibility to choose from four concentrations: fraud investigations, information assurance, cyber operations, and network forensics and intrusion investigation. Utica's programs take a particular focus on white-collar cyber crime, which is rapidly emerging as one of the most pressing digital threats of the modern age. The program leads to a wide range of career paths, including positions in the fields of banking and commerce, law enforcement, the military, information technology, and healthcare security and privacy. Students can also become certified fraud examiners, a recognized professional designation that leads to enhanced career opportunities. Students in the online cybersecurity program also benefit from the 24/7 availability of technical support for its asynchronous class structure. Successful applicants to the program generally hold an existing bachelor's degree (or higher), with a minimum GPA of 3.0. Students looking to earn a concentrated degree in cyber crime can consider New York City's Pace University, which offers a bachelor of science in professional technology studies. Program participants can choose from two in-demand concentrations that accelerate career options, including a digital forensics concentration and a business technology leadership concentration. The forensics concentration emphasizes the technical and legal skills needed to fight cyber crime, while the leadership concentration is an excellent fit for students seeking to build well-rounded skill sets that lead to leadership positions in corporate and public-sector IT departments. All coursework is completed 100% online, and transfer students with previous college experience can typically graduate in less than three years by taking just two courses per semester. The program's flexible, asynchronous structure can also accommodate students seeking to take reduced course loads or semesters off, making it an excellent option for working professionals looking to balance their educations with other commitments. The complexities of internet-based security continue to grow, and are as relevant in as many contexts as there are computers. Students can expect to gain expertise in the use of technology to help develop a practicum and precedent for future criminal investigatory bodies, as well as the ability to gain professional specializations according to their desired focus of study. While those specifics may vary according to an individual program's concentration, students can expect programs to place an emphasis on a working familiarity with the many applications of cybercrime theory. Topics covered include subjects as diverse as cyberbullying, sexting and minors, malware, and virus attacks. Before you decide on a particular bachelor's in cybercrime online program, it's important to consider the fact that individual programs may differ significantly from one another. For example, some universities may demonstrate a greater level of expertise in certain areas, while others may feature a focus unsuited to a potential candidate's projected use of a criminal justice degree track. To gain an idea of what a course for an example online bachelor's degree in cybercrime may look like, consult the following list. Computer Forensics: The study of computer forensics is essential to gain the ability to efficiently gather evidence admissible for use in the court of law. Most cybercrime programs include one or more courses in forensics and attendant computer technology systems (storage and GPS systems, for example). Homeland Security and Critical Infrastructure: This course provides with students a foundational understanding of critical data points and computer system sectors within the context of Homeland Security. Once students gain a basic understanding of system components, the course provides instruction on how to best catalogue threat risks and potential vulnerabilities in existing counter-terrorism technological standards. Information and Network Security Class: In addition to covering methods for identifying security risks, most online bachelor's degree in cybercrime programs include courses that survey basic computer security, such as firewalls, virus protection, network protection, cryptography, and digital signatures. HOW LONG DOES IT TAKE TO GET AN ONLINE BACHELOR'S IN CYBERCRIME? All online degree in cybercrime programs require that students complete a set number of particular courses for graduation. The length of time that a student may need to complete that program may differ according to the circumstances of their application and pace of learning. For example, some students may transfer in coursework from an accredited institution of higher learning they previously attended. Students can expect to encounter anywhere from a eight week to 12-week course lengths, depending on the academic lens of their cybercrime education and on potential training involving certain advanced technical specializations. Some programs require that students enter a degree course in a cohort, which allows for a synchronized discussion and online forum format. Whether a program caters to an individual course of study or a cohort model may also affect a student's application date. Generally speaking, students can expect to complete a 120-credit online bachelor's degree in cybercrime program in about four years of full-time study. Accreditation plays a crucial role in maintaining a high standard of education at institutions of higher learning. There are two varieties of accreditation of which you should be aware: regional accreditation and national accreditation. In both instances, a third party organization awards educational institutions accreditation only when institutions have met their inspection and evaluation standards. Regional accreditation is generally considered to be the more prestigious. Beyond the two accreditation varieties, there is currently no specific accreditation requirement specific to cybercriminology, but some programs work directly with governmental bodies (which a program will proudly proclaim) and some programs may also offer exclusive internship opportunities. The Department of Education (ED) is a federal agency established by the federal government of the United States in 1979 to regulate schools, coordinate federal assistance for education, gather data about schools, and enforce federal laws associated with education. The ED has no direct hand in the accreditation process itself. The Council for Higher Education Accreditation and similar bodies work to maintain educational standards, keeping universities throughout the United States competitive with colleges and schools around the world. When considering a school, potential students should look for accreditation by one of the several Council of Regional Accrediting Commissions schools. The ED hosts a list of universities that hold national accreditation. A bachelor's degree in cybercrime opens up an array of potential occupational and career paths for graduates entering the job market. Students who graduate with the skills and knowledge necessary to compete for a position in this new and exciting field stand to gain a significant leg-up in terms of their earning potential. Most occupations that require a degree in criminal justice with a concentration in internet security systems provide a generous salary. Derived from data provided by the Bureau of Labor Statistics, the table below provides some potential job placement in terms of which states boast the highest employment figures for an information security analyst position in cyber-security. Drawing on data provided by the Bureau of Labor Statistics (dated May 2016), the chart below provides a sample of average annual wages for an information security analysts employed in top industries across the United States. Like most other specialized fields, pay grade is established in a competitive economic environment and corresponds to the perceived value of the data or systems under protection. Information Security Analyst: Information security analysts are responsible for planning and carrying out the security measures deemed necessary to protect a given organization's computer systems and data network. As the prevalence of cyberattacks continues to rise, this is one of the most in-demand positions within the field. Computer and Information Systems Managers: An IT manager or an information systems manager plans, coordinates, and directs all maintenance and performance analysis related efforts within an organization. Employing a specialized skill set, IT managers help to determine what IT goals an organization may have and work to meet them. Computer Network Architects: Whether for local area networks, intranet systems, or wide area networks, a network architect is responsible for designing and building the data and communication network systems of any given project. Networks that computer network architects construct range from complex cloud infrastructure for a number of clients to small connections between two businesses. Web Developers: Cybercrime often begins with vulnerabilities in organization websites. As a professional web developer, your task is to engage with other members of a team to design, build, and maintain a secure, attractive, and fully functional web presence for an organization. Computer Programmers: A computer programmer takes the designs created by software development teams and software engineers and creates the raw instructions for computer hardware to execute a desired set of commands. Highly valued among many companies, professional computer programmers understand the rapidly changing nature of the IT industry. Organizations in the field of information security and cybercriminology offer a world of potential networking opportunities, trade conferences, and hands-on development. Specialized employment opportunities are often available directly through an existing security company. Conferences on data security are usually conducted through convention center networks, and happen at least once annually in most major metropolitan areas. Below are a few examples of notable organizations within the field of cybersecurity. Information Systems Security Association (ISSA): The ISSA is an international not-for-profit organization focused on professional information security. Founded in 1984, the ISSA provides a multitude of resources for professionals in the field. International Security Forum (ISF): The ISF is one of the most trusted voices on cybersecurity is another great resource, actively updating a wealth of independent research, valuable webinars, and writing by business leaders. Working collaboratively with its members, the ISF strives to deliver guidance on ongoing security challenges. In order to understand funding opportunities like scholarships, grants, loans and work-study, students should do their research on FAFSA loans. Many low-interest rate funds exist with banks and lending partners in education. Certain employers may also furnish the potential to complete your degree if you have an existing academic history. Some college programs are eligible for tax breaks and some military organizations (such as the ROTC) cover the cost of education in exchange for service.